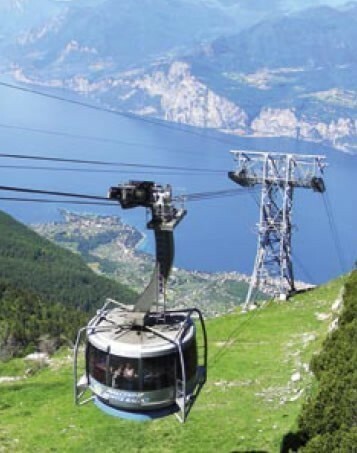 The Monte Baldo cable car joins the town of Malcesine with Tratto Spino at 1778 m. of altitude with an intermediate stop in San Michele. Monte Baldo is famous for excursions and trekking during the summer. During the winter it is frequented by skiers thanks to its 11 km. of slopes of various difficulty levels.MALCESINE – MONTEBALDO Ski Area – For the skiing season and thanks to the new ski lifts, it will be possible to ski on Mount Baldo at the Pozza della Stella, Prà Alpesina, La Cola Falco and Paperino ski lifts with special rates that are connected with the Malcesine – S. Michele – Montebaldo cableway systemAn exciting 15 minute cable car ride links Malcesine to Tratto Spino (1778 m.). It is the point of departure for hikes and excursions in summer and for the ski slopes in winter. Chair lifts and ski lifts access over 11 km of ski runs that are of varying difficulty and cover a difference in height of 400 m.
* Journeys beginning 16:00 p.m. onwards.